Need a quick lesson on Instagram hashtags? Hashtags are powerful components in your IG strategy. In fact, research shows that content with one hashtag can average 12.6% more engagement than a post without any hashtags. 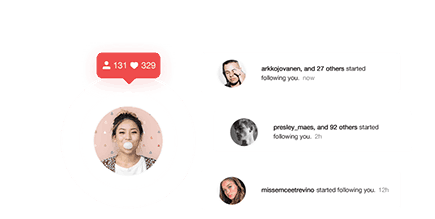 These catchy little tags help your posts reach a wider audience, ensure you can attract new followers in your niche, and improve your chances of building a strong brand image. Of course, all that power isn’t much good if you don’t know how to use it. Instagram hashtags can easily take your business to the next level. Unfortunately, if you use them too often, or without the right strategy in mind, they become #Pointless. Since Upleap is all about Instagram success, we’ve put together this guide to using and finding the right IG tags. Before we start working on your Instagram strategy, you may be wondering why you need IG hashtags in the first place. After all, surely if you produce great content, people will find it – right? Well, maybe not. With 95 million posts being shared on Instagram every day, it’s tough to make sure your brand is treads water with all that clutter. Instagram hashtags help your posts to appear in front of the audience most likely to lead to #BigMoney for your business. Hashtags make your content more searchable and appealing to your target audience. 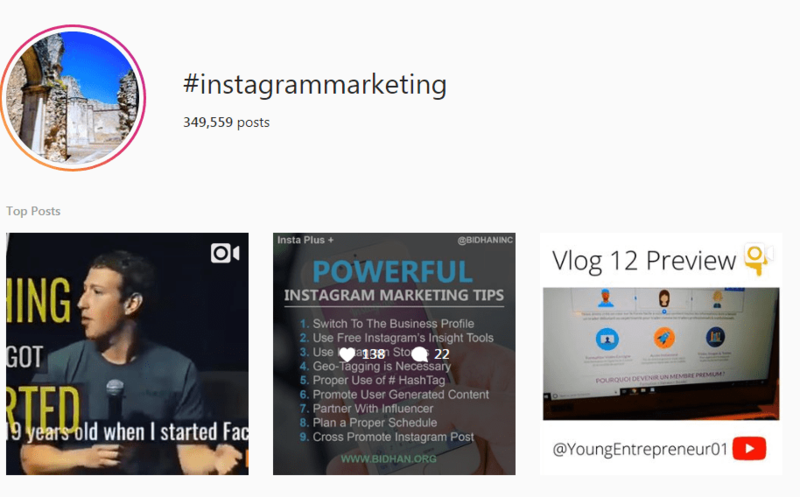 The question is, how do you find and use the right Instagram hashtags for your brand? The first thing you need to know about Instagram hashtags is that there are many different types. Let’s take a look at each in more detail, and what they can do for your brand. The chances are you’ve noticed a handful of hashtags that seem to appear in all of the top trending posts on IG. 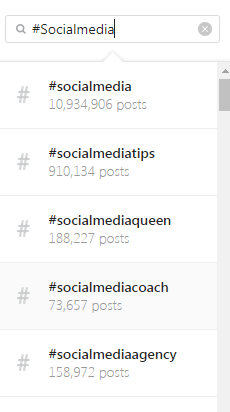 These are “popular” tags – the kind with millions of updates linked back to them. The sheer volume of popular tags on Instagram today makes it difficult for companies to get any kind of traction with these phrases alone. However, adding a popular tag to your Instagram hashtag recipe can help your content appear in front of a broader selection of customers. Since Insta now allows people to follow their favorite hashtags, two or three of these options in your posts could lead to an easy increase in authentic followers. To make an impact on Instagram, you’ll need to use smaller, more niche hashtags alongside your popular words and phrases. Think of hashtags like your marketing funnel. #Marketing throws out a pretty broad net (21,510,599 posts). However, if you narrow that down to #InstagramMarketing, you get a more refined outcome. Choosing more “niche” Instagram hashtags than popular tags might feel like you’re reducing your ability to attract new customers. However, the truth is that you’re simply making sure that you’re spending your IG budget on the right people. Niche followers are more likely to convert and support your brand. Start by looking at broad industry-level hashtags like #Marketing, #Photography, or #Digital, and narrow them down based on what you can offer your audience. 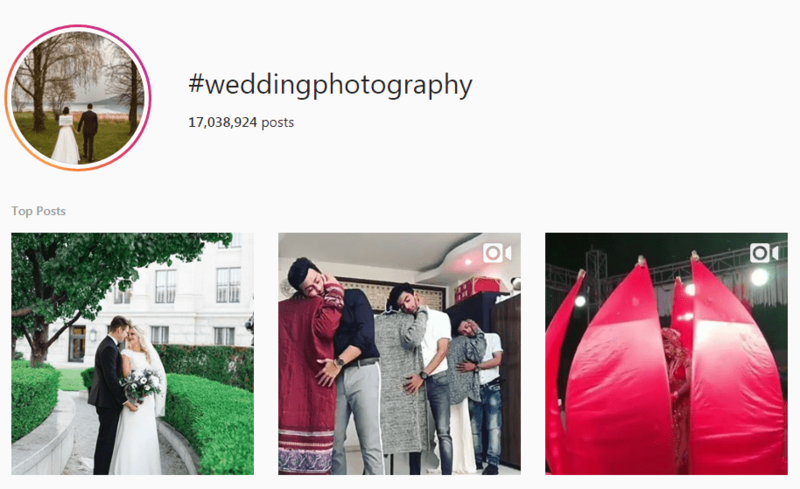 For instance, #Photography has more than 300 million posts, while #WeddingPhotography only has 17 million. It’s still a wide audience, but there’s a lot less competition. Why be a #Follower when you can be a #Trendsetter? You can create your own branded Instagram hashtags to give credibility to your identity, or organization. Ideally, your overarching brand tags should appear in all of your captions, so followers see them on a regular basis, and even start using them too. Alternatively, you can also have campaign-specific branded hashtags that help to draw attention to a particular marketing effort. Remember, when coming up with your branded hashtag, keep it short, simple and easy to remember. 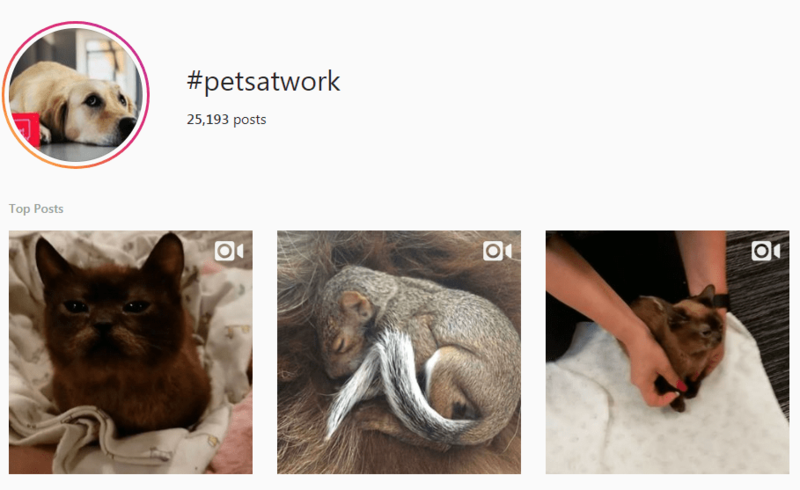 Purina’s #PetsAtWork Instagram hashtag generated a ton of engagement for the brand by encouraging people to show snaps of their four-legged friends in the office. It’s also a great example of how your branded tag doesn’t necessarily need to include a company name. Remember, tags like these need to be creative and fun. If you pull them off correctly, you’ll be rewarded with a ton of excellent user-generated content to share. Now that you know all about the different Instagram hashtags you can use to define your brand, it’s time to mix them together into a recipe for engagement. Instagram offers enough space to include 30 hashtags in each post. Many influencers and brands take advantage of all 30, although some like to stick to fewer than 10 per picture. The more time you spend on Instagram, tracking audience engagement, the easier it will be to choose the right number for you. Gathering information from Instagram Insights is the best way to build a solid Instagram hashtag strategy. For the meantime, the following formula will help you get started. Select 5 extremely popular hashtags: These are tags with millions of posts associated with them. For instance, #Cats, or #Fashion. Choose 5-7 moderately popular hashtags: These are Instagram hashtags connected to fewer than 1 million posts. However, they still have a lot of traction, like #MakeupTipsandTricks. Pick 1 to 3 branded hashtags: They might include your business name, the title of the campaign you’re running, or the name of your product. Following this formula, you’ll end up with around 20 Instagram hashtags you can use instantly. The popular tags will help you to appear in a broader range of searches, generating immediate activity for your post. The niche tags will narrow down your market and keep your content competitive in the streams relevant to your target customers. Knowing what blend of Instagram hashtags, you need to use for your campaigns is only half the battle. A lot of brands and influencers struggle with the idea of having to find up to 30 tags for every post. This concept is particularly daunting when you realize that IG doesn’t just let you use the same hashtags on all of your content. Repeating the same selection of tags could mean that you’re hit by an IG penalty. Looking at competitor posts and copying some of the non-branded tags they use. The chances are they’ll be targeting a similar audience to you, so their hashtags should be relevant. Combining successful hashtags with “related” tags: Try using different versions of a popular Instagram hashtag to expand your reach and avoid repetition. Use the Instagram hashtag: When you type a keyword into Instagram, the channel shows you a list of related tags in a scroll-down menu, perfect for inspiration. Remember, all of your tags don’t have to be unique for every post. However, you shouldn’t be using more than 10 of the same tags in any piece of content. Keep your posts unique to avoid the #Spammy label. Hashtags are becoming an increasingly complicated part of the IG strategy. In the past, all you needed to do was save sets of successful tags and copy/paste them into every photo you published on Instagram. Unfortunately, after the shadowban era, half-hearted posting just doesn’t cut it anymore. 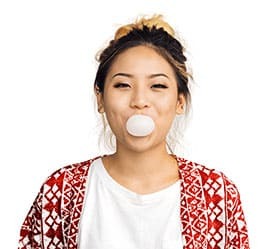 Success with Instagram tags means knowing which combination of hashtags to use, how to keep your mentions #fresh, and which words are most likely to reach your target audience. The good news is that if you get the hang of hashtags, there’s not much you can’t accomplish on Instagram. If you’re still worried about getting engagement Instagram, you can always try a shortcut by contacting the team here at Upleap. We’ll manage your Instagram growth for you so that you can take the headache out of hashtags once and for all.